Strong support for your team. Quality that gets people looking: The seamless deep-drawn support ledges help you quickly load and unload the trays. The four extra-long push handles offer an ergonomic handle height for everyone in your team - for easier pushing, pulling, manoeuvring regardless of a person's size and even with the doors opened. The high-quality design ensures excellent hygiene with minimal cleaning effort - saving you valuable time. Durable, high-quality and perfectly shaped. At BLANCO the cooling system is located directly in the doors - simply slide the cooling elements (eutectic plates) into the holders on the inside of the doors and you're done! All doors can be opened independently of each other. For removing the trays easily and maintaining the most constant temperatures possible in the interior. Manufactured of high-quality stainless steel (material 1.403). The micro-polished surface is extremely resistant to soiling and germs. One-piece deep-drawn ledge walls with integrated tip safety - without dirty joints and without sharp corners and edges. 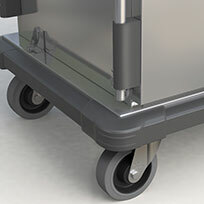 Protection with the extra-wide all-round bumper rail for trolleys, furniture and hands when pushing. Four ergonomic push handles make transport easier.